The ChrootEveryone setting will make PureFTPd chroot every virtual user in his home directory so he will not be able to browse directories and files outside his home directory. The CreateHomeDir line will make PureFTPd create a user's home directory when the user logs in and the home directory does not exist yet. AnonymousOnly must be set to no because otherwise only anonymous FTP sessions will be allowed. 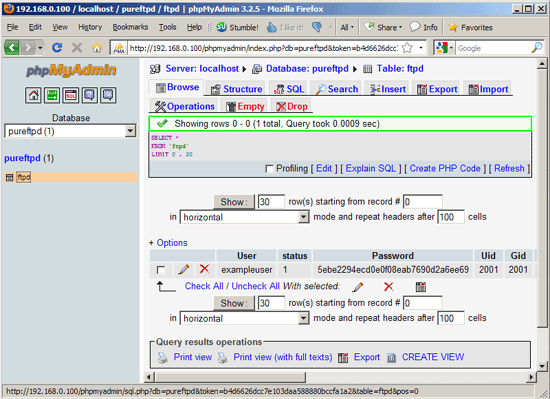 For most people it is easier if they have a graphical front-end to MySQL; therefore you can also use phpMyAdmin (in this example under http://server1.example.com/phpmyadmin/ or http://192.168.0.100/phpmyadmin/) to administrate the pureftpd database. If you want to create an anonymous ftp account (an ftp account that everybody can login to without a password), you need a user and a group called ftp. Both have been created automatically when you installed the pure-ftpd package, so you don't need to create them manually. However, ftp's homedir is /srv/ftp by default, but I'd like to create the anonymous ftp directory in /home/ftp (the normal users' ftp directories are in /home as well, e.g. /home/www.example.com). 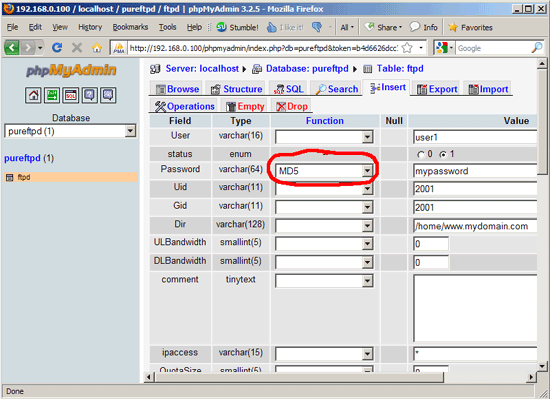 But of course, you can use the /srv/ftp directory for anonymous ftp, if you prefer it.